Restaurants are ramping up takeout and retail square footage in a move to expand their customer base, a trend that calls for leading-edge merchandising equipment. Well-designed display cases can improve operational efficiencies, create competitive differentiation and increase sales. When Sara Weeks Dima, co-owner of R&D Foods in Brooklyn, N.Y., evaluated potential displays for her new eatery, she sought to combine “tried and true” classic fixtures, such as built-in shelving and glass- front cases, with the unique style of hanging shelves and repurposed antiques. As part of Peter Piper Pizza’s new generation of restaurants, clean, vibrant and simple communication is the objective of the display cases. The equipment is in sync with the reconcepting of the 135-unit Phoenix-based chain. 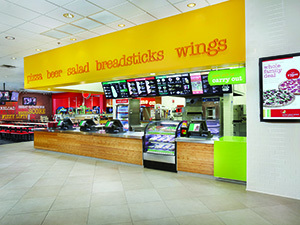 Peter Piper uses two types of display units with branded header cards and shelf talkers. One type promotes bottled beverages, especially adult offerings such as beer and wine, which are positioned in an adult’s line of site behind the counter. The other case is typically in-line with the counter, and is used to promote the chain’s new hand-chopped grab-and-go salads, along with organic milks and juices for kids. At the three-unit My Burger fast- casual concept in Minneapolis, Vice President Paul Abdo chose display equipment that blended into the background so it wouldn’t take away from the industrial decor or general vibe. The modern burger joint includes a vibrant color palette, warm wood tones, riveted industrial concrete and original illustrations. The equipment also had to be relatively maintenance free, offering a “set it up and forget it mentality,” says Abdo.